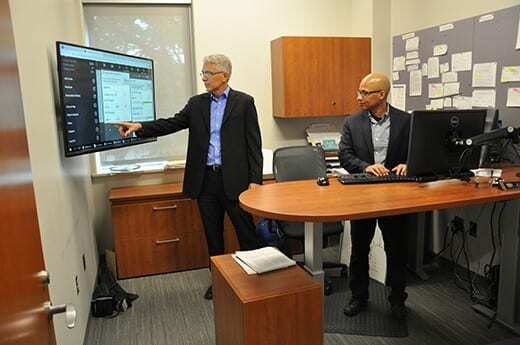 Kansas State University’s Doug Walker, left, and Edward Nowlin, both associate professors of marketing, go over results from their research on whether participation in fantasy sports can lead to increased betting on sports and online gambling. Does participation in pay-to-play fantasy sports lead sports fans who may not otherwise gamble to engage in sports betting and other online gambling activities? According to new research from Kansas State University, that could just be the case. Fantasy sports leagues have exploded in popularity in recent years. The rise of the internet has made it easier than ever for friends, co-workers or random people from around the world to put together seasonal leagues or engage in pay-to-play daily fantasy games. According to the Fantasy Sports Trade Association, 59.3 million people in the United States and Canada participated in fantasy sports in 2017, spending more than $500 per year on average. Coinciding with this rise in popularity come concerns about the nature of fantasy sports: Is it a game of skill that requires no oversight, or is it gambling? Thus far, fantasy sports have been exempt from the regulations on sports gambling, but with a 2018 Supreme Court decision allowing sports gambling to be regulated on a state-to-state basis, are there public policy concerns to address as sports gambling rapidly becomes more widely available? Kansas State University associate professors of marketing Edward Nowlin and Doug Walker, along with their colleague David Houghton of Xavier University, dive into these questions in a forthcoming paper in the Journal of Public Policy and Marketing. The paper, “From Fantasy to Reality: The Role of Fantasy Sports in Sports Betting and Online Gambling,” finds interesting insights into the relationship between fantasy sports and gambling, and the impact that intersection might have on public policy concerns. The effects of fantasy participation on other areas of gambling were especially pronounced among fans who were low in materialism — the importance given to the ownership and acquisition of material goods — a well-known precursor to gambling behavior. Even for those high in materialism, the process of participating in fantasy sports accounted for half of the impact of sports fanship on sports betting, and these effects held when looking at online gambling in general. While fanship directly increases participation in sports betting only for the materialistic, fanship leads to high participation rates in pay-to-play fantasy sports for everyone — materialistic or not. The significance of these findings has only been enhanced with the recent Supreme Court decision in Murphy vs. NCAA, which allows the legality of sports betting to be determined at the state level. States and companies are ready to pounce on the estimated $150 billion wagered illegally on professional and amateur sports each year, but that raises new questions that will shape public policy on the issues in the coming years, according to Nowlin and Walker.